In keeping with my SWEAT MORE mantra for the week, I woke up this morning, put on some warm clothes, and jumped on the treadmill. After warming up I set it on the highest incline and started walking. I walked on the incline for 25 minutes. Felt like a great workout. For breakfast I was craving an unusual combo of foods. I cut a Flatout wrap into triangle "chip" shapes, sprinkled cinnamon and sugar on them, and baked them in the oven. 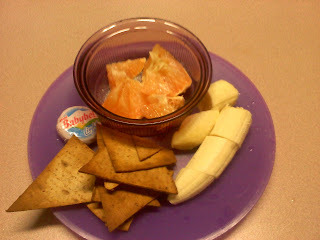 With that I had a banana, a grapefruit, and a Babybel light cheese wedge. Strange but it was yummy and my tummy is good and full! !